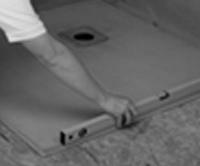 Ideal for use with underfloor heating, the boards are easy to fit and provide a level and unobstructed shower base. 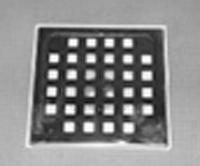 The board is a 20mm reinforced thermal insulation board with preformed slopes to a central or offset drain position. 6 options are available and boards can be easily cut to size if require. Living Heat showerlay trays are designed for wetroom instillations where floor tiles are to be used. Ideal for use with underfloor heating, the boards are easy to fit and provide a level and unobstructed shower base. 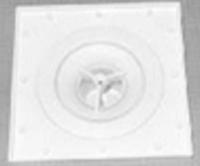 All boards require a suitable drain unit available from Living Heat Heating. 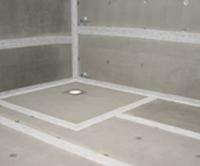 Wetroom Insulated Showerlay Shower Tray Forma's. 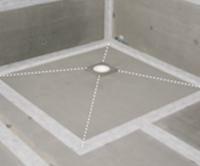 Living Heat showerlay trays are designed for wetroom instillations where floor tiles are to be used. Ideal for use with underfloor hearting the boards are easy to fit and provide a level and unobstructed shower base. 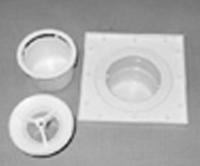 The board is a 20mm reinforced thermal insulation board with preformed slopes to a central or offset drain position. 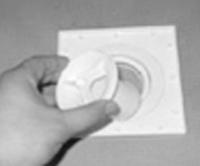 6 options are available and boards can be easily cut to size if required All boards require a suitable drain unit available from Living Heat Heating. Please make sure to fully read and follow these instructions to achieve best results when fitting Living Heat showerlay trays. 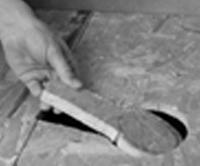 1: Floor surface, (wood or concrete) must be solid, level and ready to accept a standard 1 part flexible tile adhesive (used to hold the tray in place). 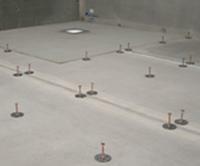 2: Lay the tray in place and clearly mark the drain position onto the floor. 3: Cut a hole in the floor large enough for the waist to TIGHTLY fit through. The hole can be extended in one direction slightly (See picture) to help locate the pipe connection. 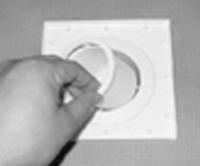 Care must be taken to make sure the reinforced backer plate on the back of the tray covers the drainage hole. 4: Check there is no excessive movement around the drain cut out. If movement is apparent then additional support should be fitted under the floor close to the drain cut out location to minimise this movement and support the shower tray. 5: Fit the pipework and connect the drain in place making sure all joints are watertight. 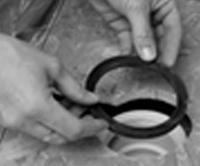 6: Place the black rubber O ring over the top of the drain housing. 7: Spread the whole area where the tray is to be fitted over using a notched trowel with a good quality 1 part flexible cement based tile adhesive. 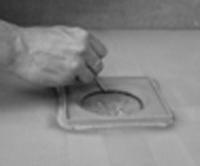 8: Place the tray over the adhesive and press the whole tray firmly down into the adhesive. Make sure the tray is level and all edges fully supported with adhesive. Clean of excess adhesive from the edge of tray and drain cut out edges before leaving alone until adhesive has set. 9: Stages 9 + 10 + 10a should be done simultaneously. Run a generous amount of silicone around the upper drain hole edge, (blue area), of the shower tray. Now without delay follow step 10. 10: Run generous beads of silicone around the inner and outer flat area on the Underside of the great support. Turn over and position directly over the tray drainage hole. 10A:Without delay insert the male threaded part of drain and screw tightly down to the drain below using the tool provided, making sure there are no crossed threads. 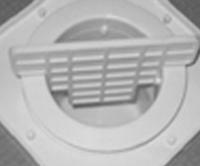 The grate support should be held square to the tray whilst being tightened. Clean off excess silicone around edge. 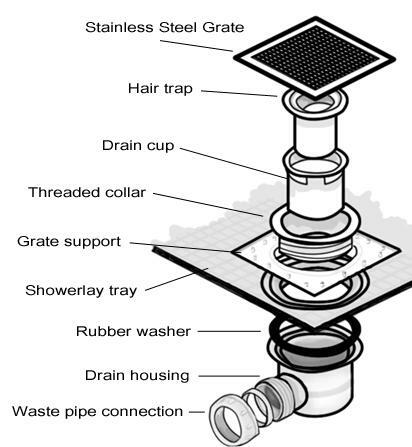 11: Insert the trap and hair filter followed by the stainless steel grate. The edge of the tray will need to be built up with either Living Heat 20mm cementatious tile backer boards or and alternative 20mm layer such as marine ply. All joints and adjoining surfaces should be waterproofed and tanked prior to tiles being fitted to avoid water penetration in these areas. Below can be seen a floor completed using 20mm cementatiouse tile backer boards fixed with board washers (alternatively adhesive can be used). The following picture shows all joints taped with Living Heat aqua seal tape and left ready to tile over. 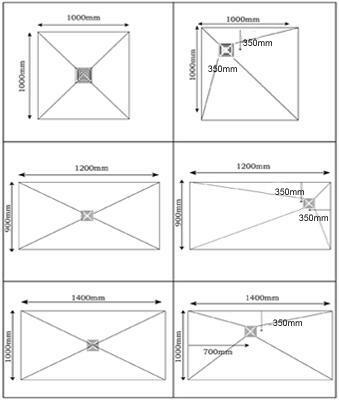 If using tiles larger than 10 x 10cm the tiles should be cut along the lines shown in the 3rd picture to maintain the tray falls so water is guided towards the drain location. Note: *The natural fall of the tray must always be maintained to effectively guide water toward the drain. The tiles must however finish flush with or higher than the great cover. *During the tiling / grouting process the drain and great should be covered to make sure adhesive, grout and other debris does not enter the drain. *Living Heat Underfloor heating is suitable for use directly over the showerlay trays but the must not obstruct the drain. 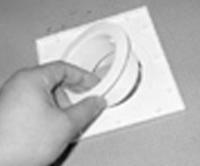 *All Living Heat trays can be cut down in size if require but no cut edge must come within 150mm of the drain. 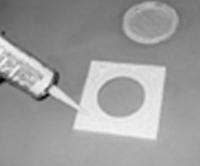 *The tray must be fully bedded on a suitable good quality flexible tile adhesive. 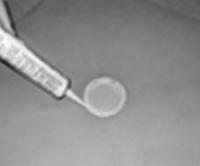 Particular care should be taken to ensure all drain edges and outer edges of the tray are fully bedded to maximise support and minimise movement. If using Living Heat 20mm cementatious tile backer boards please follow the following instructions to create a tanked wetroom area ready for tiles to be fitted directly over. 1A: Using 20mm Living Heat tile backer boards, cover the whole floor area, fixing the boards down using a good quality flexible cement based tile adhesive or screws and washers at every 30cm, (12 per board). 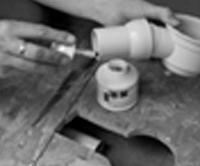 All joints should be butted up tight together and boards staggered where possible. 2A: Living Heat 10mm or 20mm tile backer boards can also be used to insulate and waterproof the walls. When fixing these boards to walls screws and washers will be required at a maximum 300mm centres, (12 per board). Like on the floor all boards should be tightly butted together. 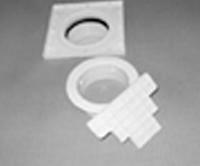 3A: All joints should be should be taped with Living Heat self adhesive waterproof tape. Corner joins should first be filled with silicone prior to taping. Where corners meet the vertical joint these should be taped last and extended over the bottom horizontal tape to fully cover the joint.